The following is applicable to and important information for all appointed clergy and assigned lay supply. 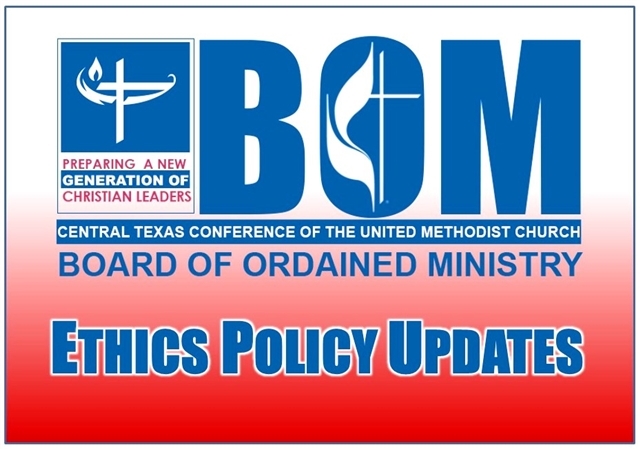 The Central Texas Conference Board of Ordained Ministry has voted to make changes consistent with the overall ethics policy adopted at Annual Conference 2013. The first change regards action to be taken if a clergyperson or lay supply is out of compliance with the conference’s preventing sexual misconduct training. The amended policy statesthat appointed clergy who fail to comply with the mandatory training will be referred by the Executive Committee to the Cabinet for placement on involuntary leave; licensed local pastors will be referred by the Executive Committee to the Cabinet to have their license revoked and the Executive Committee will recommend to the Cabinet that lay supply will no longer be assigned. The second change concerns those serving in extension ministry appointments as those persons must take the Our Sacred Trust training provided by the Lewis Center, regardless of what training is provided and/or required at their ministry setting. All clergy and lay supply will be emailed a letter from Jim Conner, chair of the board, outlining these changes. To read the letter now, click here. Both changes to the policy mentioned above will be effective January 1, 2014.